ZWO Camera With EOS Lens - How do you mount this thing? I just ordered a ZWO/Canon adapter. 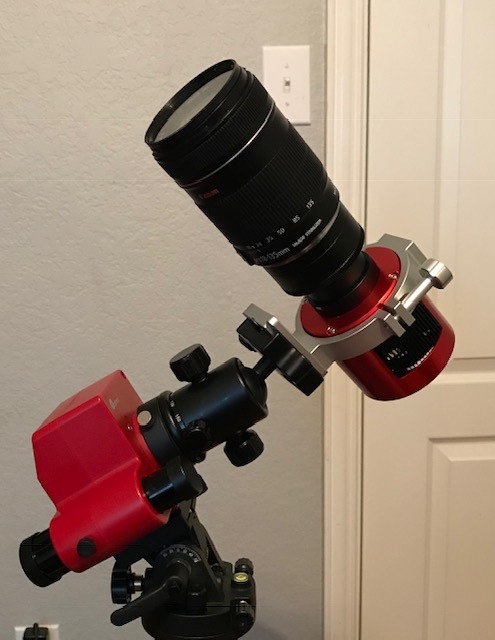 Now I am wondering how one mounts the camera on a tripod or piggyback on a telescope. Surely someone out there has successfully accomplished this. How did you do it? Something like this may work if you have, or have access to, a 3d printer. Edited by ronpen, 03 January 2019 - 08:01 PM. Multiple options - some longer lenses have a 1/4x20 female thread near to the balance point - you can attach this to a tripod or to a scope-mounted adapter. Alternatively, most (if not all) the ZWO cams have a 1/4x20 female thread on the rear of the cam. You can either mount this directly to a tripod, or utilize a right-angle bracket to mount to a scope. It wraps ariund the camera and provides a 1/4x20 mounting thread for a tripod or an equatorial mount. Neither my camera (ZWOASI294MC-Pro) of Canon lens have a threaded attachment hole. Barrett: That will work. Another $50 is not so bad. Thanks for the information. Maybe this is also an option?? Which lens are you attatching? Assuming you want to attach the 294 + a canon lens to a camera tripod. This the correct holder ring for OP's 294. Others, note that some ZWO cooled cameras like my ASI071MC Pro need the 86mm ring. I have a Vello Ring that clamps on a couple of my Canon Telephoto lenses. This gives better balance with the clamp roughly in the middle of the telephoto-and-ZWO camera assembly. I will use the 86mm ring when I use short FL lenses like 35mm and 50mm with my ZWO camera. I bought that ZWO holder ring, but the feet isn't matching or tight in the saddle of Vixen or Losmandy style, so i must use another dovetail under it, didn't try that yet, but luckily my Canon 300mm has that tripod mount leg or collar so i just connected to a dovetail with Vixen style and i am using it for now, i asked that last year and didn't get good enough answers, and still not answers if i am going to use that canon lens without tripod collar, but i will be happy with my large lenses that already have tripod collars, i don't have any 3D printers. With a big lens like that, you will have better balance using the tripod collar for the lens. The collar will be close to the balance point. If you tried to put a 300mm lens on the ZWO camera, and mount using a ring on the ZWO camera, there is a lot of torque on the connections that might sag. And might make it tough for your mount to track depending on your mount. 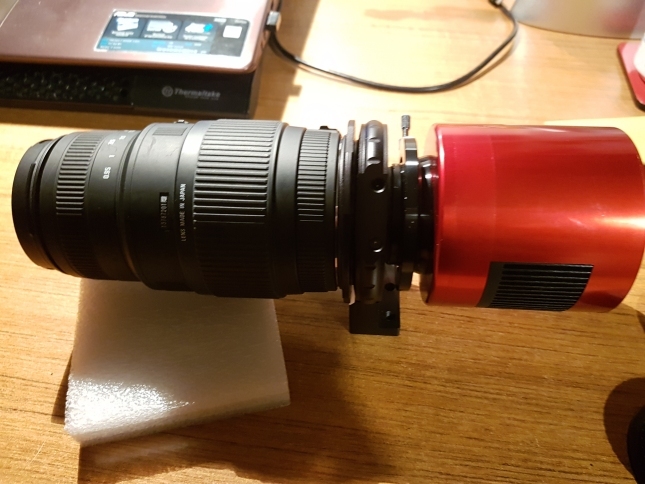 This is what i am trying to learn or test or practice with, so far i didn't rely on that ZWO camera holder ring, and i don't know why it is not holding the camera really tight, the camera is QHY163M, and it has almost same diameter as ZWO [78mm], and later i may use that as some Canon lenses doesn't have that tripod collar so i will definitely use the camera holder ring after all, but maybe they are smaller lenses so it might not be a big problem. Edited by TareqPhoto, 06 January 2019 - 12:19 AM. But can you use that with a filter wheel? 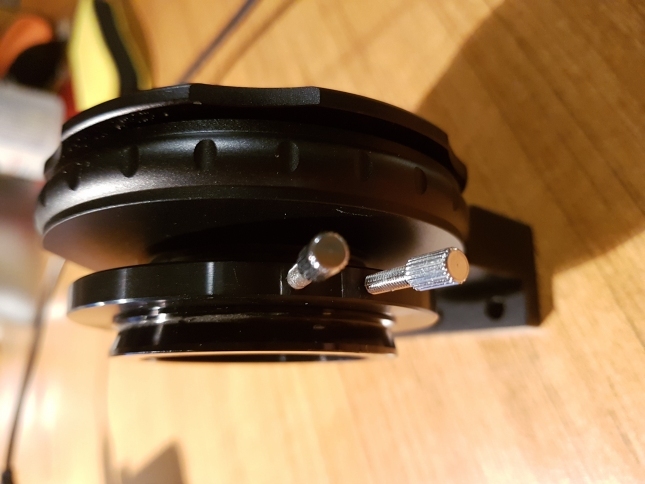 I also connected a rotation adapter so the camera can be rotated. Edited by Mert, 08 January 2019 - 03:38 PM. Edited by Mert, 08 January 2019 - 03:47 PM. Try this if you want to get by on the inexpensive...…. Please don't tell me that's a field rotator on the back of that adapter. I'm going to cry if that's the case, as my Geoptik adapter has no such thing, making imaging over many nights interesting if I need to take the camera off for any reason. Yes it is, but I added it to the adapter seperately, was not expensive! It is very thin and just screws onto the adapter. in order to get focus under control. was also ordered from Teleskop-service, if I find it I'll post it. Edited by Mert, 09 January 2019 - 04:37 PM. Thanks for all of the tips. I am all set, even figured out the back focus requirements. This holder ring is a nice one, but i am using QHY camera, and although the ring is same diameter of the camera when closed but it doesn't lock tighter around the camera, so i don't know if it was not perfect fit ir i need something else to make it tight and in place. Another problem is that i am using AZ-EQ6 mount which has Losmandy/Vixen style saddle, this holder ring is small, it didn't fit in that saddle, it is smaller, so i need to use a separate dovetail to accept this holder or change my mount saddle, i can't be sure if i buy a bar that accept my mount from one side and another side it is small to tight the holder leg/dovetail. 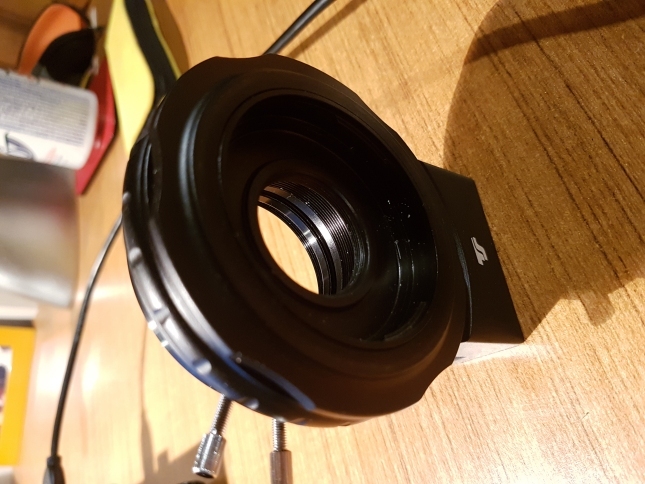 I want to fine a solution because i am starting to use Canon lenses that have no holders, so i will depend on this camera holder ring, and i am using filter wheel too. The holder ring ends with a tripod mounting so you need a Vixen dovetail with a tripod screw. Also ZWO/QHY cameras can differ a bit in size and that can cause the holder to no catch the camera tightly. You have to use slightly smaller diameter for the holder or wrap something around the camera (painting tape?) to add that missing mm to the diameter. I added pieces of papers to make it tighter around the camera. I will try to connect that tripod mounting to one of dovetails i have and see if it works. the same time, nicely done! Edited by Mert, 11 January 2019 - 02:09 PM. If you mean that ZWO holder silver one then i bought mine from ZWO site itself, free shipping for me, many asia markets/stores offer free shipping for me which is a big plus than for example European/North American ones.